A quick shot of a sub adult Albertosaurus attacking a Struthiomimus, both from Canada. 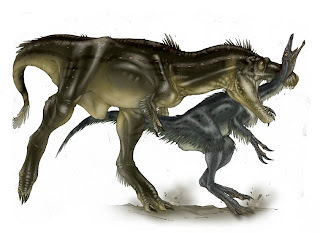 Albertosaurus grew to around 30 feet and Struthiomimus got to around 15 feet. Paleontologists are still not sure what the orstich mimic dinosaurs ate, everything from filter feeders to omnivors have been proposed. I'll have to see if I can get Jess to do a color tutorial. I wouldn't know where to begin!